As far as I know nobody but nobody decorates with shiny brass anymore. That means there's a boatload of cast-off brass lamps available for transformation. Abby saw beyond the brass, got to work with some silver leaf, and spruced up this reject to a more understated elegance. 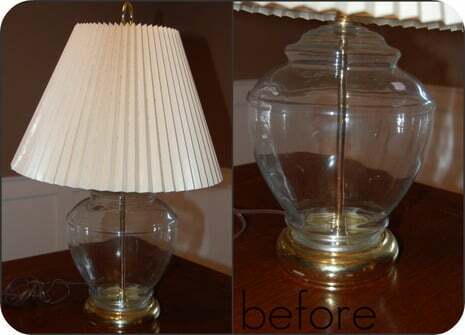 Now it coordinates with another one of her rescued lamp makeovers. So these are the BEFORE pics. Dear Goodwill, Are You Getting Too Big For Your Secondhand Britches? Table purchased Saturday at a city wide 1/2 price sale at Goodwill. In one out of ten posts I usually mention a shopping trip to Goodwill. For me, it's Mecca, one of my favorite places to relax and do some serious creative thinking. I promote you; I laud you on your good works and pure mission, etc. However, the prices on used furniture and furnishings have skyrocketed beyond realistic value. I mean, come on!!! Classes are filling and expanding. I wish everyone could come to my home studio (basement) and learn fast and easy techniques to transform your Goodwill trashy furniture into upcycled beauties. The new class started last night and each one brought a simple piece and a difficult piece. We got started on the easy ones first to get the feel of the tools, staple gun, and to fully understand why upholsterers charge the prices they do. Here's a perfect example of Beginner's Instant Gratification. You can't imagine my joy when I read the ApartmentTherapy LA post today informing us that felt showed up as a sure trend at ICFF. For so many reasons, felt is fabulous! It's natural, insulative, easy to sew, easy to mold, comes in various thicknesses and colors and it doesn't fray or ravel. Good thrifting advice is to go ahead and buy a piece if it stands out from the ordinary. What stood out about this table? The legs. Modern, sleek, solid wood and sturdy. The supports are also solid and can be used again, I'm sure. The table tops are a composite wood covered with formica and a plastic band around the edges. See three more very different looks you can get with this $6.99 Goodwill table.